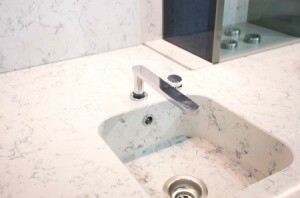 If your sink is actual marble and not cultured marble, one recommenced cleaner is D2 Biological Solutions. This is a guide about how to clean a marble sink. I have a marble sink in a vanity top which is difficult to clean. What is the best way to clean a marble sink and keep from scratching it? Window cleaner like Windex words great on just about anything. It gets rid of soap scum and makes things shine. We have hard water here in Greece, and lots of soap scum. The best thing that I have found is using Liquid Calgon (the one for washing machine). I just put some on an old sponge and rub over the scum gently. Leave for a few minutes, then rub off. It gets all the scum off. Is it ok to use the same cleaner that we use for toilet commode (cleanx)? NO. Marble is fragile. The National Trust recommends a product called "D2 Biological Solutions," which is a mild but amazing product. I've used it on tombstones out in the elements and think of it like using hydrogen peroxide on your teeth. I've been using it on some marble tabletops with less results (I think my tables must have some wax finish that I can't see, so that the product isn't getting down into the marble). Can marble sinks be cleaned with baking soda? Great info on the subject. Use a non abrasive cloth regularly and StonetechPro has great products you might consider. I have a marble sink, vanity, tub and tub surround up to the ceiling. The product that I use is Gel-Gloss. It is a wax that cleans, seals and protects. Fiberglass & Marble manufacturers recommend it. The water pebbles off beautifully after a shower. It leaves a smooth sealed surface that resists water spotting and staining.